Start from the 'mask' and build the entire front face area. Then work down the body closing it at the very bottom. 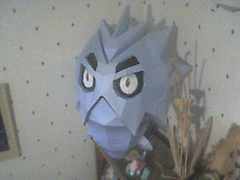 You MUST have cardstock to build this. Normal printer paper is not going to hold up at this size.